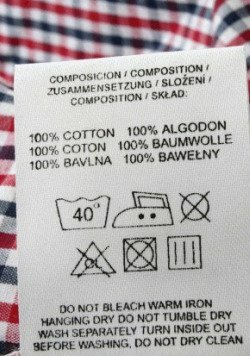 "Read and follow the advice of the laundry symbols on your laundry tags." That is the most common advice given when you have a doubt or question about how to wash your clothes. Now, don't get me wrong, that is good advice. In fact, I have given this advice myself, and I continue to stick by it. Especially if you are in doubt, follow the instructions provided. However, have you ever tried to actually follow all the instructions on laundry tags before? Probably not, because that is way too much work. If you actually followed all the instructions to the letter for every item for every full load of laundry you have you would instead do about 5 small loads. That is not efficient, and your household does not have time for that. So, when can you safely ignore laundry symbols and laundry tags, and when will this have dire consequences? What happens if you wash an item that says "wash separately" with other items? What if you hang on a hanger to drip dry the clothing that says it should be "dried flat?" What if you wash in the delicate cycle something that says it must be "dry cleaned?" Pink laundry if it was a red sock in with the whites, for example. A stretched out article of clothing that no longer has the right shape. Most likely nothing, it will probably come out fine. Does that third answer surprise you? It did me. Read on to learn why this is so (hint, it is because of government regulations). A dirty little secret about laundry tags is that they do not necessarily tell you how to clean the clothes the best way possible. Instead, laundry care symbols and tags tell you what they are required to say by the Federal Trade Commission (FTC) to meet that federal agency's regulatory requirements. As with most regulations, the laundry labels we as consumers read do not always best inform us of what we most want or need to know. So, the mission becomes how to interpret the secret code given on these clothing tags to be able to know what you really can and cannot do to get your clothes clean. It used to be that clothing tags said words like, "dry clean only" or "machine wash, tumble dry." These words can be hard to interpret in themselves because of the legal meaning of them, versus the practical meaning. In addition, there is a (relatively) new layer of complexity because tags can now contain no words, only laundry symbols. Actually, they have used these laundry symbols instead of words in Europe for a while, but the United States was slow to adopt this. The FTC originally created a great resource for consumers, but has since taken down their handy chart. I've now found another chart of laundry symbols and what they mean. I suggest that you print the first page of it off and post it in your laundry room for reference. Want more information on how to interpret pictures on your care labels? Check out this quick video on how to decode care labels here. Now, the rest of this article will discuss what some of the terms and symbols mean to parse the legalese so you can know what to do to properly launder your clothes, but still do it efficiently and without too much risk of damage to items. Generally the laundry symbols on your family's clothes tell the most conservative way to clean a garment. This is so the manufacturer does not get into trouble if the clothes are ruined by a harsher treatment. They just say you didn't launder them properly because you were too harsh on them. Never mind that the most conservative method does not always get clothes very clean, or cannot be used when you need to remove stubborn laundry stains. There is a big difference between a laundry tag or laundry symbol that says "dry clean only" versus one that merely says "dry clean." Beware of words like "only," "no," and "do not," because if these words are on a laundry label they generally need to be taken seriously. When the term "only" is used regarding dry cleaning, do not pass go, do not collect $200, go directly to the dry cleaner. If, on the other hand, the word "only" is absent, you can take the chance and risk it. You will need to look not only at the main fabric, but all linings and embellishments to see if each part can be washed either in the washing machine and/or by hand. Only if the most delicate parts of the garment can stand washing in water (and each part is colorfast) should the garment go anywhere near water. Further, when a laundry label says "hand wash," this means it should not go in the washing machine, even in the delicate cycle. I have found I can put most of these items in the washing machine in the delicate cycle anyway even when it says not to, unless it says "only," but I know I am taking a risk. Do not do anything besides follow the instructions meticulously if you cannot bear the thought of ruining the item. However, if a temperature for the water is listed you have been put on notice that a higher temperature may (but not necessarily always) be bad for that item. The same rule applies with the dryer -- no mention of a temperature means that it can be dried on the hottest setting if you wish. Otherwise, if a temperature is mentioned, you have been put on notice that a higher temperature may harm the item. Silence, or not mentioning an issue, typically means that you can do whatever you want in regard to that issue, such as any type of bleach, any type of water temperature, and any drying method. When you see the instruction, "machine wash, tumble dry," this means you can use any temperature for washing, any temperature for drying, and can also use any type of bleach you want, and it does not need to be ironed. Clothes with these instructions in the laundry label means it is one of the best types of play clothes to get for kids, because kids can be rough on clothes, and this means you can be rough back to get them clean. Pay Attention When The Laundry Tag Says "Wash With Like Colors" Or "Wash Separately"
When a laundry tag says "wash separately" or "wash with like colors" I generally try not to even buy it (I will make an exception, sometimes, if it says it must be washed separately only for the first few loads). This language means that the dye in the fabric is not color fast and will bleed onto anything else washed with it. Families with small children do not have time to be doing lots of little separate loads of laundry for one or two items at a time. Therefore, these types of warnings make me run the other way. Any household with children needs both chlorine bleach and color bleach in their laundry supplies. Most people know that chlorine bleach cannot be used on colors, at least not consistently. In addition, there are some colored fabrics where just one wash with chlorine bleach will ruin them. Therefore, if you need or want to use chlorine bleach on any colored fabrics it is important to look at the laundry symbols first to understand the amount of risk you are incurring. The care instructions regarding color bleach, also known as nonchlorine bleach or oxygen bleach, are far less clear than they should be. Because of FTC regulation manufacturers cannot just say you can use nonchlorine bleach on an item. They have to say, "only nonchlorine bleach when needed." The "when needed" part of the laundry tag seems to imply that using color bleach every load would be bad, but that it can be used occasionally. Ironically, color bleach cannot change dingy clothes back into bright ones. Instead, the power of color bleach is that it can keep bright clothes staying that way and prevent dinginess, but only if used consistently. In general, if a fabric is safe for color bleach sometimes, it is safe for it to be used consistently on the garment, despite the "as needed" portion of the instruction that implies otherwise. If a laundry symbol indicates "no bleach," neither chlorine bleach nor color bleach can be used on the article, at least regularly. If no mention is made of ironing on the laundry labels that means you do not need to iron the garment, but if you wanted to that would be OK. I personally hate to iron, and try to do it as infrequently as possible, so I take my clothes out of the dryer promptly or follow these steps to reduce wrinkles if I forgot to get them out when the dryer stopped. If a care label says it must be ironed it seriously will need to be ironed -- like it will be a wad of fabric when it comes out of the dryer. Because manufacturers know people, in general, do not like to iron they try to avoid mentioning that something needs to be ironed regularly unless it really has to be. Therefore, don't be surprised if some clothing that does not mention ironing at all in the care instructions looks pretty wrinkly coming out of the dryer and could use a good pass with the iron. I generally run away from clothes in the store if they say they will need to be ironed because I know I won't do it often, and will basically be wasting my money if I buy it. Further, if a tag says "do not iron," believe it. Do not even touch it with an iron for a minor touch up. You will most likely be sorry. I hope this article helped explain what laundry symbols mean and also gave you some loose guidelines to follow for when you can and cannot ignore them. There are never any hard and fast rules, but the more laundry you do the more you will get a feel for what will and will not work when bending the rules.